This is a very rare find, in my opinion . Till July 2007, not only did I not own any of these poker chip cards, I never knew they existed, and I have been checking out "poker chip" items on eBay for over 10 years!. They are not in Seymour's "Antique Gambling Chips" book. I consider this a "must have" for the dedicated poker chip collector. Owners of the cards are instructed to cut out the two printed poker chips on each card (see the notation "cut out chips on outsides" at lower right of the card). One expert on these Exhibit cards (see his informative web page -- http://imageevent.com/exhibitman/interestingexhibitcards ) said that these cards are rather rare due to their old age and the fact that "not a lot of these cards survived as a result" of being cut up for poker chips and coupons on the reverse side (coupons not shown in these photos). The card is the standard size of Exhibit Supply Co. cards -- 5-1/4" x 3-1/4." The poker chips would be 2" in diameter.. The same designs came in red, white and blue stock so the kids who bought the cards at a penny apiece could have red, white and blue poker chips. Note, for example, that the Jack Holt cards pictured below are in red and white. The cards were produced by the Exhibit Supply Co. of Chicago and sold through vending machines. The postcard-size, heavy stock cards covered a litany of subjects including sports, movie stars, pin-ups, etc. 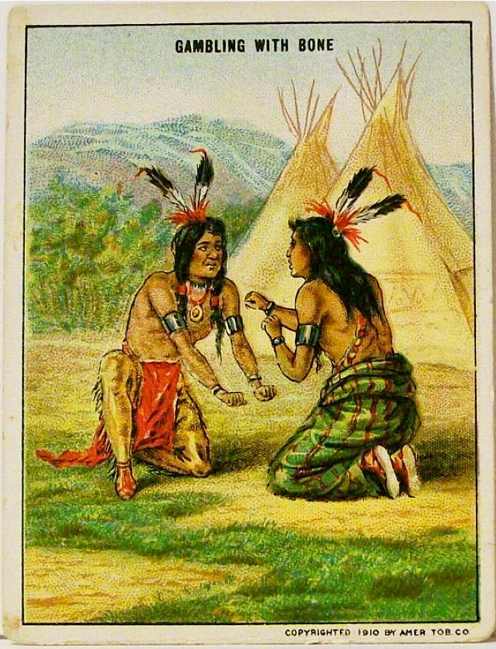 The cards are dated copyright 1929. Each card contains two photos of silent screen movie cowboy stars of the time inside a round poker chip intended to be cut out and used (as evidenced by the instructions at the bottom). The cards are all dated on the bottom left corner and include a coupon on the reverse. Cleverly positioned, the cutting out of the two poker chips will not damage the coupon on the reverse. 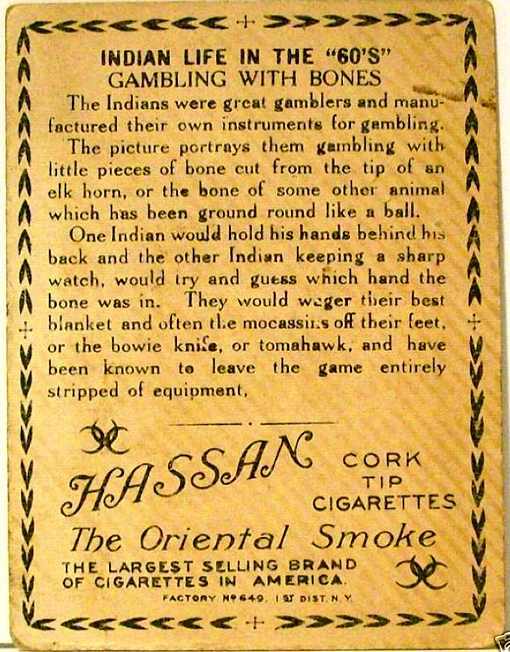 The Exhibit cards were designed to be sold direct, without a product (such as bubble gum or tobacco), which was the distinguishing feature of the cards. The Company functioned for about 50 years -- 1921 to about 1971. They sold penny (and later nickel and dime) vending dispensing machines to retailers for just about cost, and made their profit by selling cards to fill the machines (I own one such machine, by the way). Copyright 1910. 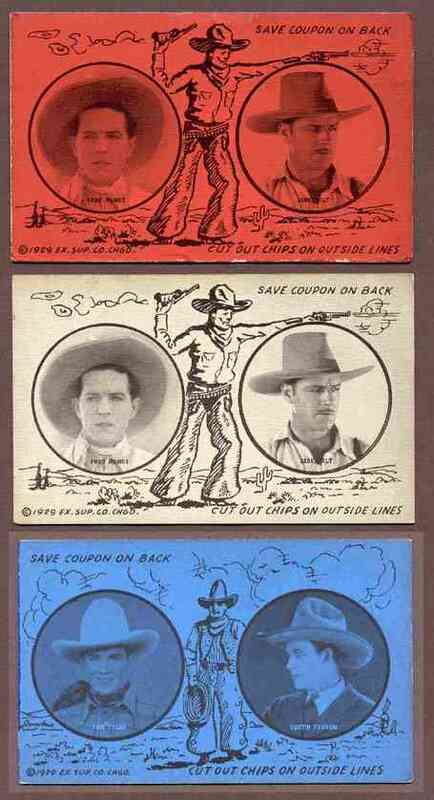 Trading cards like these were inserted in tobacco products.